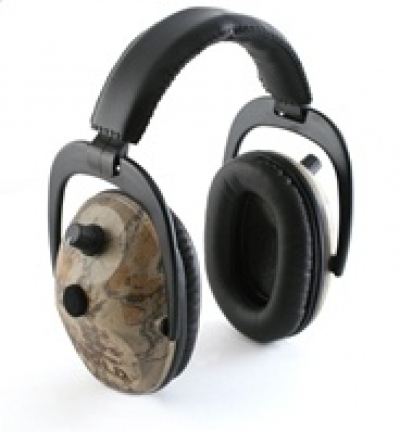 Montana Test.com - Results for: Pro Ears Predator Gold NRR 26 Electronic Ear Muffs! Made in USA! Reviewed! Pro Ears Predator Gold NRR 26 Electronic Ear Muffs! The Pro Ears Predator Gold is the first for us from Altus Brands. We contacted them because it appeared to be sound product and are Made in the USA. We find very few outdoor products on the market today that carry that label. When we find a few we like to point it out. We received the Pro Ears Predator Gold. This is an Electronic ear muff or as we like to call them ear protection. As shooters of all kinds of weaponry we need to protect what is left of our hearing. The advancement in hearing protection is now space age and Pro Ears are no exception. Each side has two batteries and a circuit board. You insert batteries from inside each ear muff and you will see the circuit board. You can change the settings on each side with a pair of tweezers but be very careful. The purpose for changing you can plug in an outside source like an MP3 player and listen while shooting and still keep gunshots muffled no louder than 82 dB. Pro Ears engage DLSC™ technology it is Dynamic Level Sound Compression. It reacts instantly to any noise over 82 dB. This technology allows you to hear conversations but any sound over 82db is muted. The dB rating is determined by Noise Reduction Rating that provides standardization for hearing protection; Pro Ears are tested and certified. The goal of any ear protection is keep damaging noise from harming the inner ear. Pro Ears accomplish that and allows you to hear mellower sounds and protect against louder damaging high decibel explosive sounds. I have used on a few occasions and they in fact do work. My four year old granddaughter used the Predator Gold on her first duck hunt. At her age protecting her hearing is imperative. Available in behind-the-head headband at total weight of 7.8 oz. The Gold Series Advantage is the balance achieved between comfort, noise attenuation and purity of sound. No compromises. No excuses. Natural replication of amplified sound. Real audiophiles understand that for purity of sound an analog sound system is superior to a digital sound system, however, digital systems can correct imperfections or enhance and modify sound better than analog systems. Most active hearing protectors or stereo headphones employ one technology or the other. Our engineers at Pro-Ears were not willing to compromise the quality of our sound for the sake of simplicity or cost. The result is the hybrid digital/analog system found exclusively in the Gold Series active hearing protectors. To further enhance the natural sound quality we use gold connectors and high quality amplifiers and microphones to reduce impedance. Our proprietary software reduces interference caused by wind while enhancing the sounds you want to hear. Advancements to our exclusive DLSC™ technology for compression turn an impulse sound wave from a gunshot into a soft, audible pop. Finely engineered circuitry with proprietary programming has reduced attack time to 1.5 milliseconds. We provide adjustable gain control so you can adjust the industry leading sound amplification to match your situational needs. Two are better than one. Most electronic hearing protectors are controlled by a single circuit board. One circuit board may cost less and be lighter weight than two boards, but when it comes to sound quality, it is a compromise Pro-Ears is not willing to make. A circuit board in each cup means no wires to get hung up as you are getting into your tree stand. In a rough situation where your ear muffs get banged around or dropped, one damaged circuit board will not knock out your whole system. The ability to adjust each cup to match your personal hearing profile is part of the competitive advantage. So comfortable you won't mind wearing these earmuffs all day. There is an unavoidable trade off in designing earmuffs between compression of the headband and noise attenuation. Sound pressure waves penetrate hearing protectors through the cup, ear cushion and any gap separating the cushion and the surface of your head. One way to reduce gaps is to tightly squeeze the cups to your head. The problem with this approach is that the tighter the squeeze, the greater the headache. This is particularly true if the ear cushion does not balance the resistance and compensate for the headband compression, which causes the hard cup material to press against your head. Most people only wear uncomfortable earmuffs for short periods of time, and as a result their hearing is at greater risk. Our designers have found a method to reduce the gaps and increase the effectiveness of the ear cushions. Our use of visco-elastic foams and exclusive Pro Form™ leather in our ear cushion provides an optimum balance of noise attenuation and resistance to headband compression. Before you buy your earmuffs you should squeeze the ear cushions. If they compress easily or if they are made of vinyl (think sweat) you should think about how long-term wear will feel. We believe our ear cushions not only perform great but feel good too. Once you try our ear muffs we think you will agree. Our reliability gives you the confidence to be your best. The ability to focus is essential for top performance. Fear of equipment failure takes away from your focus. That is why we take pride in being the first company to install an 8 bit microprocessor that runs continuous diagnostics on all critical components and ensure your earmuffs are in top working order. An LED light tucked into the ear muff informs you your system is working. An audible low battery alert gives you plenty of warning that you need to change your battery before it fails. Military grade circuit boards are used to reduce failure due to handling and the elements. The auto shut-off feature extends battery life so when you need it you can count on power. We believe in our American made product so much, we have provided the longest, most comprehensive warranty in the industry. We can afford to back up our product with a generous warranty because so few Pro-Ears fail. Independently tested and certified. Wearing Pro-Ears can help ensure you will be your best.